Here is a free list of stocks that will go ex-dividend next week. Anyone owning theses stocks before ex-dividend date will be receiving a cash dividend check from their investments. It is not too late to own these stocks to get their dividend payments. In the table above, the ex-dividend date is highlighted in red along with the dividend yield for the stock. Ex-dividend dates are extremely important in dividend investing. You must own a stock before its ex-dividend date in order to be eligible to receive its next dividend. If you are not in the company's record books on the date of record, you won't receive the dividend payment. To ensure that you are in the record books, you need to buy the stock at least three business days prior to ex-dividend date. The day that the public traded company declares an upcoming dividend payment to shareholders. The first day on which a shareholder can sell their shares and still be entitled to receive the upcoming dividend payment. The day which shareholders receive dividend payment. The day when you must be on the company's books as a shareholder to receive the dividend. The ex-dividend date is normally set for two business days before the record date. The day in which the stock ownership transferal is finalized. Also known as T+3. Trade Date + 3 business days. The grace period allowed to settle a trade. This is the final day to transfer stock ownership and money between the parties involved in the stock transaction. The day in which you place an order to buy or sell a stock. Please remember to bookmark this page. 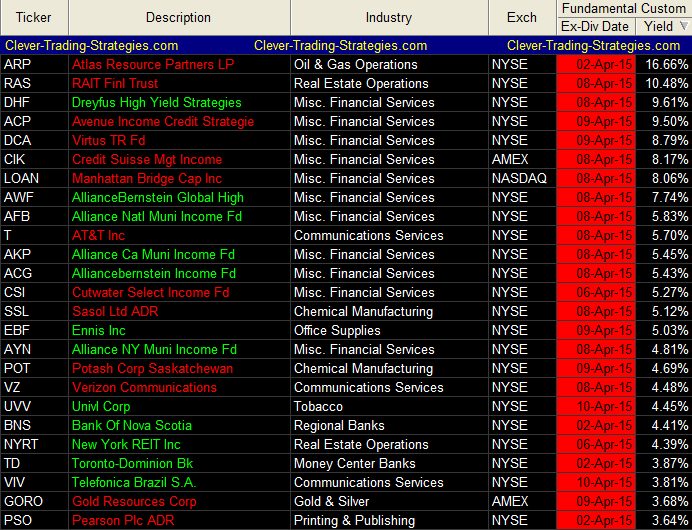 This stock list of dividend capturing strategy is updated as soon the stocks are about to pay their shareholders. Remember to check back often to see new additions to the list.